The use of visible light emitting diodes (LEDs) as an alternative to Q-switched lasers conventionally used as photoacoustic excitation sources has been explored. In common with laser diodes, LEDs offer the advantages of compact size, low cost and high efficiency. However, laser diodes suitable for pulsed photoacoustic generation are typically available only at wavelengths greater than 750nm. By contrast, LEDs are readily available at visible wavelengths below 650nm where haemoglobin absorption is significantly higher, offering the prospect of increased SNR for superficial vascular imaging applications. To demonstrate feasibility, a range of low cost commercially available LEDs operating in the 420-620nm spectral range were used to generate photoacoustic signals in physiologically realistic vascular phantoms. Overdriving with 200ns pulses and operating at a low duty cycle enabled pulse energies up to 10µJ to be obtained with a 620nm LED. By operating at a high pulse repetition frequency (PRF) in order to rapidly signal average over many acquisitions, this pulse energy was sufficient to generate detectable signals in a blood filled tube immersed in an Intralipid suspension (µs’ = 1mm−1) at a depth of 15mm using widefield illumination. In addition, a compact four-wavelength LED (460nm, 530nm, 590nm, 620nm) in conjunction with a coded excitation scheme was used to illustrate rapid multiwavelength signal acquisition for spectroscopic applications. This study demonstrates that LEDs could find application as inexpensive and compact multiwavelength photoacoustic excitation sources for imaging superficial vascular anatomy. 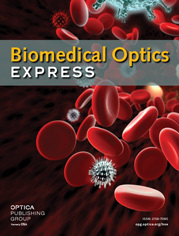 T. J. Allen and P. C. Beard, “Pulsed near-infrared laser diode excitation system for biomedical photoacoustic imaging,” Opt. Lett. 31(23), 3462–3464 (2006). R. G. M. Kolkman, W. Steenbergen, and T. G. van Leeuwen, “In vivo photoacoustic imaging of blood vessels with a pulsed laser diode,” Lasers Med. Sci. 21(3), 134–139 (2006). K. Daoudi, P. J. van den Berg, O. Rabot, A. Kohl, S. Tisserand, P. Brands, and W. Steenbergen, “Handheld probe integrating laser diode and ultrasound transducer array for ultrasound/photoacoustic dual modality imaging,” Opt. Express 22(21), 26365–26374 (2014). T. J. Allen and P. C. Beard, “Light emitting diodes as an excitation source for biomedical photoacoustics,” Proc. SPIE 8581, 85811F (2013). R. Skov Hansen, “Using high-power light emitting diodes for photoacoustic imaging,” Proc. SPIE 7968, 79680A (2011). T. L. Troy, D. L. Page, and E. M. Sevick-Muraca, “Optical properties of normal and diseased breast tissues: prognosis for optical mammography,” J. Biomed. Opt. 1(3), 342–355 (1996). C. R. Simpson, M. Kohl, M. Essenpreis, and M. Cope, “Near-infrared optical properties of ex vivo human skin and subcutaneous tissues measured using the Monte Carlo inversion technique,” Phys. Med. Biol. 43(9), 2465–2478 (1998). C. Willert, B. Stasicki, J. Klinner, and S. Moessner, “Pulsed operation of high-power light emitting diodes for imaging flow velocimetry,” Meas. Sci. Technol. 21(7), 075402 (2010). B. E. Treeby and B. T. Cox, “k-Wave: MATLAB toolbox for the simulation and reconstruction of photoacoustic wave fields,” J. Biomed. Opt. 15(2), 021314 (2010). J. Laufer, D. Delpy, C. Elwell, and P. Beard, “Quantitative spatially resolved measurement of tissue chromophore concentrations using photoacoustic spectroscopy: application to the measurement of blood oxygenation and haemoglobin concentration,” Phys. Med. Biol. 52(1), 141–168 (2007). J. Laufer, C. Elwell, D. Delpy, and P. Beard, “In vitro measurements of absolute blood oxygen saturation using pulsed near-infrared photoacoustic spectroscopy: accuracy and resolution,” Phys. Med. Biol. 50(18), 4409–4428 (2005). M. F. Beckmann, H.-M. Schwab, and G. Schmitz, “Optimized SNR simultaneous multispectral photoacoustic imaging with laser diodes,” Opt. Express 23(2), 1816–1828 (2015). H. Zhang, K. Kondo, M. Yamakawa, and T. Shiina, “Simultaneous multispectral coded excitation using periodic and unipolar M-sequences for photoacoustic imaging,” Proc. SPIE 8581, 85812Y (2013). M. P. Mienkina, C.-S. Friedrich, N. C. Gerhardt, M. F. Beckmann, M. F. Schiffner, M. R. Hofmann, and G. Schmitz, “Multispectral photoacoustic coded excitation imaging using unipolar orthogonal Golay codes,” Opt. Express 18(9), 9076–9087 (2010). M. P. Mienkina, C.-S. Friedrich, N. C. Gerhardt, W. G. Wilkening, M. R. Hofmann, and G. Schmitz, “Experimental evaluation of photoacoustic coded excitation using unipolar golay codes,” IEEE Trans. Ultrason. Ferroelectr. Freq. Control 57(7), 1583–1593 (2010). R. Y. Chiao and X. Hao, “Coded excitation for diagnostic ultrasound: a system developer’s perspective,” IEEE Trans. Ultrason. Ferroelectr. Freq. Control 52(2), 160–170 (2005). K. Maslov, G. Stoica, and L. V. Wang, “In vivo dark-field reflection-mode photoacoustic microscopy,” Opt. Lett. 30(6), 625–627 (2005). Fig. 1 Optical spectra for a range of commercially available LEDs (Mightex Systems). Fig. 3 (a) Photoacoustic imaging setup (b) Time-resolved photoacoustic signals of three 1.4mm tubes filled with human blood (35% haematocrit) and immersed in 1% Intralipid (μs’ = 1mm−1), (c) Reconstructed photoacoustic image. P = 9µJ, N = 5000. Fig. 4 (a) Schematic and photograph of the four wavelength LED, (b) Experimental setup, comprising a 2.4mm diameter blood filled tube immersed in a solution of intralipid (µ’s = 1mm−1). Fig. 5 Photoacoustic signals generated in a realistic tissue mimicking phantom at (a) λ = 460nm, P = 1.8µJ, N = 10,000 (b) λ = 530nm, P = 0.4 µJ, N = 10,000 (c) λ = 590nm, P = 1.7 µJ, N = 10,000 and (d) λ = 620nm, P = 2.7 µJ, N = 10,000. Fig. 6 Absorption spectra of oxy and deoxy haemoglobin overlaid by the photoacoustic spectra obtained from the blood filled tube using the four wavelength device. Fig. 7 Photoacoustic signals obtained when driving all four wavelength simultaneously and for a single wavelength at λ = 620nm. a) Time domain signals b) frequency domain signals. Fig. 8 Photoacoustic signals generated in a realistic tissue mimicking phantom before and after filtering at (a) λ = 460nm, (b) λ = 530nm, (c) λ = 590nm and (d) λ = 620nm. Fig. 9 Experimental setup and an example of a Golay excitation code (N = 8bit) based on transmission of four unipolar codes: Ap/An and Bp/Bn represent the positive (1) and negative (−1) bits of the biphase code A and B respectively. T is the time delay between consecutive unipolar codes. Fig. 10 Photoacoustic signal generated via (a) Golay codes (b) pulsed excitation. A and B denote the photoacoustic signal and an acoustic reflection generated at the water air interface, respectively.